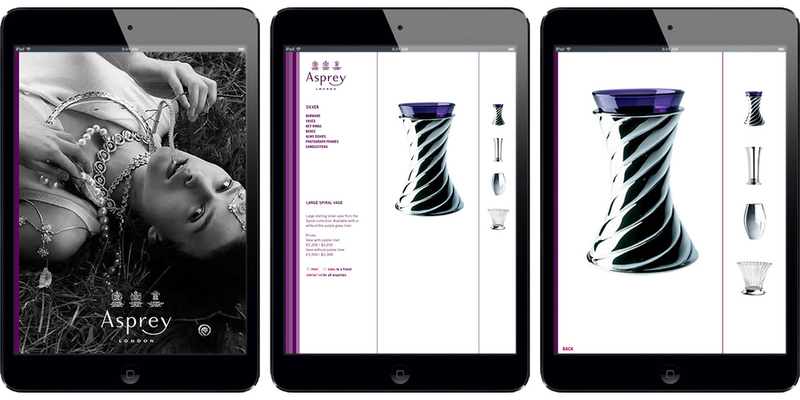 GALLÉ, DESIGN FOR LUXURY BRANDS: Brand assets and website design for Asprey, the ultimate British luxury lifestyle brand. The Asprey website was created when the company had just de-merged from Garrard and was in the process of redefining its identity. The focus here was on reserved style and subtlety. The "stripe" concept became the leading graphic determinant in all our graphic communication pieces: as the minimal aesthetic unit to define Britishness, the stripe can be seen in many typically British iconic products, be they pinstripe suits, school ties, polo outfits or the famous Rolls-Royce grille.